Perch Pub – Located on the second floor, Perch Pub boasts spectacular views of the Avenue of the Arts, along with a menu of American-inspired comfort food. Like a good traditional pub, there are separate areas for dining, playing darts and just sitting at the bar to watch the game. The Perch Pub offers patrons a perfect spot to kick back and 'roost' in comfort, above Broad and Locust Streets with floor-to-ceiling windows overlooking Philly's Avenue Of The Arts. With a menu of delicious American-inspired comfort food, Perch is a relaxed, unpretentious pub. The interior has a timeless feel, with rich mahogany finishes and exposed brick and metal beams. In addition to boasting one of the best birds-eye views in the city for people watching, the pub offers separate areas for a pool table and dart board and features additional amenities including a juke box, HDTV's and a large drop-down projection screen in the main dining room for watching major sports events. 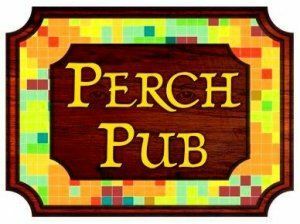 Perch Pub has a broad selection of fourteen craft beers on tap, an extensive bottle and can list (104 entries and growing), as well as full bar featuring a prominent selection of bourbons, whiskeys, and Scotches (including house-infusions).